Sciblogs | Say what now? 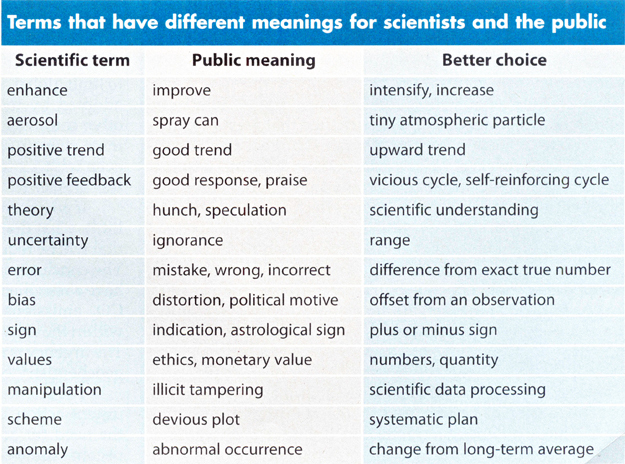 Scientists and the public often seem to speak a different language. And no, I’m not necessarily talking about the dense jargon employed by scientists or, to be frank, the private (or public!) sectors. Instead, I’m talking about some pretty common words, like enhance*. Or aerosol, or manipulation, or, even, scheme. Taken from the article Communicating the Science of Climate Change (1), I think it’s a stark (and extremely useful reminder) to science communicators everywhere to bear your _audience_ in mind when talking science. If a scientist about whose work you are writing gives you stick for using a non-technical term, or a synonym for manipulation which you know the public would understand as ‘scientific data processing’ rather than ‘illicit tampering’? Explain to them, very sweetly, that they’re not the audience. It looks a good list, although I personally think offering just one alternative for â€˜biasâ€™ is difficult because there are many different forms of bias. The other side of the coin is (of course) that science education is not up where it should be. If a greater percentage of the population understood the correct scientific meanings, there would be a ‘flow-on’ effect, as they explained things to others. I know my flatmates have learned a lot from watching documentaries with me, and asking me to further explain stuff they don’t quite ‘get’.